A view of the innermost region of an active galaxy reveals a rigid conventionality of scientific vision. 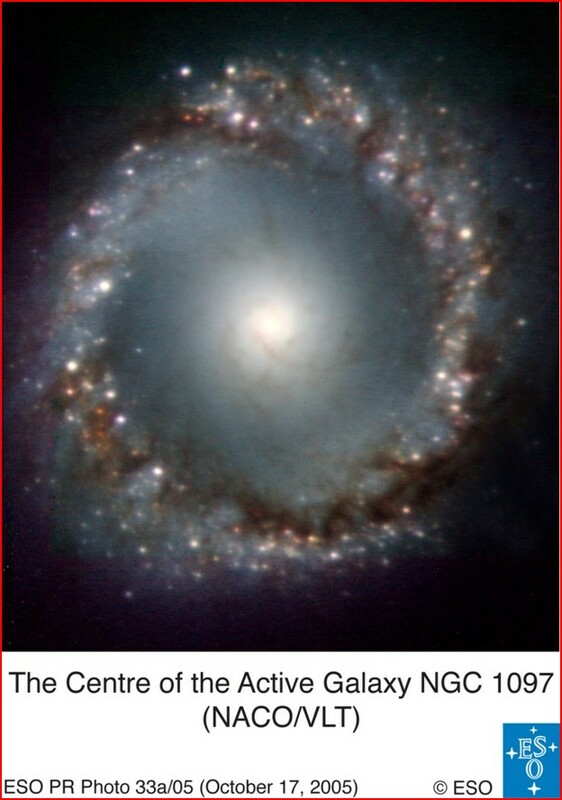 This image from the European Southern Observatory shows the inner 5500-light-year region of the barred spiral galaxy NGC 1097. According to the press release, it shows a “ring of dust and gas” surrounding a “super-massive black hole” at the center and a “filamentary structure spiralling down” into the black hole. The press release notes that this Active Galactic Nucleus (AGN) at the center is fainter than most, indicating that “only a small amount of gas and stars” are falling into the black hole. The latest generations of telescopes can see ever more details in ever smaller fields of view. A crippling side effect, however, is the loss of vision that connects these details with larger-scale phenomena. An AGN, for instance, is not defined by “gas and stars” falling into a black hole: In standard theory, almost every galaxy—AGN or not—has gas and stars falling into a black hole. An AGN is distinctive because it is active: It has knots of ionized hydrogen (such as the bright spots in this “ring”) that are considered to be star-forming regions. And it usually has a jet emerging from it. This galaxy is famous for its “dogleg” jet—a narrow filament that ends with a right-angle turn into an arc. Another fainter jet extends from the nucleus in the opposite direction. Still another jet and counter-jet extend through the nucleus with a 20-degree-or-so angle of rotation from the dogleg. X-ray and radio images of NGC 1097 show lobes of emission in line with the jets. Especially to the north, the lobes resolve into strings of bright sources. Many of these have been identified as quasars and galaxy clusters, objects considered (by standard theory) to be far beyond the galaxy. A plot of all quasar and cluster locations in the area around the galaxy shows that their numbers increase toward the galaxy and that they, too, are aligned with the jets. (See pp. 43-47 in Seeing Red by Halton Arp.) For distant objects that have no connection to the galaxy, this is strange behavior. But to look outside the narrow field of view of modern telescopes is to look outside the narrow field of explanation of modern theories. What if the rings of material around AGNs are composed not of gas and dust but of plasma? What if the filamentary structure is not gas and stars falling into a black hole but Birkeland currents driving a plasma focus? What if quasars and galaxy clusters are ejected from AGNs? 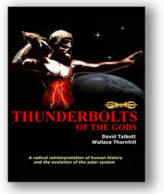 The properties of plasma can be investigated in laboratories on Earth. The properties of black holes can only be deduced from the malleable mathematics of conjecture. Active Galactic Nuclei stand in contrast to the ossified idealism of a science that has lost touch with its empirical roots.